In today’s busy time, not everyone is able to read their favorite books or view their favorite videos at the time that they want to. 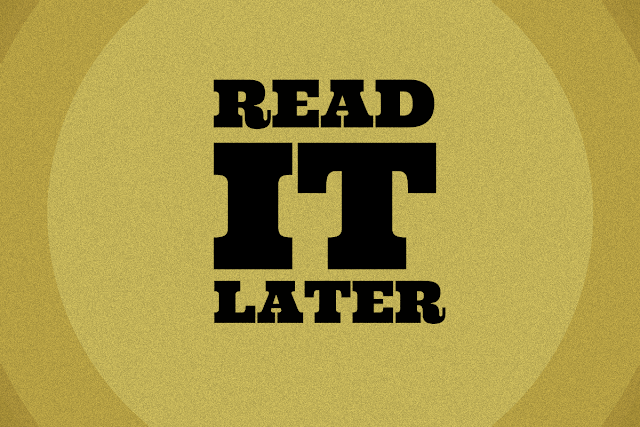 Read-it-later apps are the perfect solution for this problem. These apps helps you save your favorite stuff and view it later. This article will offer an insight to a few useful and popular apps of that category. This is the most popular app in this category. Perhaps until last year the name of this app was Read-it-Later, which perfectly describes the utility of this app. The app has 12 million active users and it can easily integrate 300 apps. The app has the feature of syncing all across your devices and puts you emails to the queue, which you can read later without an internet connection. This one of the popular iOS app that can integrate 150 iOS apps at one time. It has a galore of features and its easy-to-use design helped making it a popular app in the arena. Its punchline “Save Anything. Read Anywhere” is justified for the service that it offers to its users. The new app has the look and feel of iOS 7 and offers more filtering and sorting options. This is another user friendly app that users can customize according to their requirements. It offers features like customizing the reading view, tagging the articles, sharing the saved stuffs to your social media account and easy send to Amazon Kindle. This is meant for simple apps, it also makes it easy to read web articles. Clearly from Evernote is a fairly new in the foray of read-it-later apps. But since its launch, it has made its position among the well-designed read-it-all tools. The focus of the app is generally towards the text and it removes excess clutter; this facilitates users to experience a reading that is customized and distraction free. This app runs in popular browsers like Chrome, Opera or Firefox. It is just like a list that you can use for reading. You can save all your favorite articles in this app. This app not only allows you to read your favorite articles at your convenient time, but also allows you to share them with others. Moreover, this all-in-one app allows you to discover interesting articles, save content to access it later and share your list with others. This is the app that you would need to build your online library and it consists of many amazing features. This can be your one stop collection of stories, research, notes and inspirations. You can categorize your collection as public or private and share them with a group of people whom you would like. You can save your ideas and what's more, find the app useful for design projects. Flipboard acts as a personal magazine. This is a one stop shop for stuffs that you want to discover, collect and share. Various categories such as news, Twitter, photography, Instagram can be found in this app. Additionally, you can browse the section that you want to see the content for and enjoy. It has the wide array of sections to choose from. This is like an online storyboard where you can post your story and embed the same in any social media. This is the app that users use to create stories from what people post on a social media site. This site has been a phenomena as it is building a new network of information that offers a social perspective of any event. This one of the powerful apps that has the ability to create powerful connection with just a simple statement “if this then that”. Essentially, IFTTT has 129 channels that include Facebook, Evernote, LinkedIn and many others. These channels are the basic building blocks of IFTTT and each channel have their own Triggers and Actions. 'Recipes' of IFTTT are its Triggers and Actions. This is a useful web application that enables its user to instantly send any webpage to Amazon Kindle. It also enables its user to receive fresh stories from favorite RSS feeds on Kindle. The app has enhance readability feature for all forms of text and also retains all the embedded images within the text. This app is best for reading long articles as well. Moreover, it has tracking features. As the name suggests, Readlists is the app that has a group of web pages ranging from recipes, articles, course materials or anything for that matter. You can list your favorite reads and it gets featured in the home page of the website. You can use your Readability log in credentials to log in to Readlists. This app is undoubtedly one of the best platforms to share your favorite reads.